* Watching Sunday's game, it is clear that Alex Ovechkin and Evgeni Malkin clearly don't like each other. Several times in the game, Ovechkin looked like a heat-seeking missile hoping to blow up Malkin along the boards. * The Malkin/Ovechkin dynamic was just one of the reasons Sunday's game on NBC was the reincarnation of "Must-see TV." * Sunday's heartbreaking loss to the Penguins marked the first time the Caps had lost back-to-back games in regulation since coach Bruce Boudreau took over in late November. Just an unbelievable run! * And don't go blaming Nicklas Backstrom for that loss. Yes, his own-goal was the difference in the game, but the Caps should not have been in that position in the first place. The club severely out-shot the Pens, but couldn't get enough pucks past Marc-Andre Fleury. * Staying in the Southeast for a minute, CTN extends congratulations to Tampa Bay coach John Tortorella, who became the all-time winningest American-born coach with Tuesday's romp past the Islanders. It was win No. 235 for Torts, one more than Bob "It's a Great Day for Hockey" Johnson. * The Edmonton Oilers should ask for some comp time. Those boys have been playing a lot of hockey, going to extra time on 22 occasions this season. All told, that is 105 minutes and 18 seconds of bonus hockey. * Atlanta has worked harder though, playing 23 overtime games involving 113 minutes and 11 seconds of bonus hockey. * Edmonton's Andrew Cogliano has scored the OT winner in each of Edmonton's last three games. He's the first rookie to score an overtime goal in consecutive team games since the five-minute OT was introduced in 1983-84. He is the only player in NHL history to score OT goals in three straight games. * Dallas' Steve Ott better have his head on a swivel the next time he faces Colorado. Ott knocked defensemen Ruslan Salei and Jordan Leopold out of Sunday's game in the span of less than 10 seconds. Ott was suspended by the NHL for three games for his behavior against the Avs. * Speaking of punches, it looks like Samuel Peter could add some excitement to the heavyweight division in boxing. The man punches like his fists are made out of cinderblocks. Just ask Oleg Maskaev, who got destroyed by those punches in Saturday's title fight. * Colorado's trades are not paying huge early dividends. Adam Foote was too injured to play Sunday, while Peter Forsberg was injured in the game. And Salei's eye injury may prove to be serious as well. * It's nice to see Steve Kelly back in the League. He played his first game of the season Sunday, suiting up for the Wild. The No. 6 overall pick by Edmonton in 1995, Kelly never panned out as expected. He had played the past three years in Germany and has just 148 NHL games to his credit. * Shane Doan, Jarome Iginla, J.S. Giguere, Martin Biron and Petr Sykora were just some of the first-round selections taken after Kelly back in 1995. * Congrats to Jarome Iginla on become the leading scorer in Calgary Flames history with Monday night's goal, No. 365 of his career. Theo Fleury, the former record holder, shouldn't take a back seat to many people, but Iginla is one of them. * Congrats, too, to Cam Janssen, a CTN favorite son. Janssen got an assist Monday night, the first of his 98-game career. He scored a goal, his first NHL point, last season. * Mud Bruneteau's got nothing on these boys. The Michigan High School State Championship Game between Marquette and Orchard Lake St. Mary's went eight overtime sessions before the 1-1 game was abandoned and the teams were declared deserving co-champions. * Mud Bruneteau, for those of you that don't know, scored the goal that ended the longest playoff game in NHL history. He scored 116 minutes and 30 seconds into OT to give Detroit a 1-0 win against the Montreal Maroons back in 1936. * CTN isn't saying he'll win it, but Colorado goalie Jose Theodore should get some love for the Bill Masterton Trophy, right? He won just 13 games last year and lost his grip on the starting job. This season, he has 22 wins and counting and has shaved almost a full goal off his goals-against average. * Think the Vancouver Canucks are glad to see the last of the Kings for this season? The Canucks were 46 seconds away Monday night from being swept by the last-place Kings before Ryan Kesler scored a game-tying goal and added the OT winner. 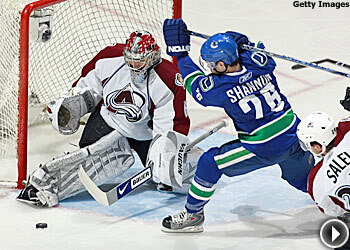 * Canucks center Brendan Morrison made his return from a long-term wrist injury in Monday's game. He looked good at times and tentative at others. But if he can find his stride, the Canucks automatically become a more dangerous team. * CTN went to the movies Sunday night for the first time in recent memory. Once CTN got over the sticker shock of what a ticket and a popcorn-and-soda combo ran, CTN really enjoyed The Bank Job. CTN recommends it to anyone that likes a good story or, like CTN, likes to hear some English accents and terminology. * The Kings are having a March Madness-style competition to determine the fans' favorite player from 64 pre-selected choices. CTN played out the bracket in his head and came up with Dave "Tiger" Williams, Luc Robitaille, Rogie Vachon and Ian Laperriere in his Final Four. Check out the action on their site. * Dan Cleary has signed a five-year extension with the Red Wings. The Cleary/Detroit dynamic is a match made in heaven and a run of 20-goal seasons shouldn't be too much to expect going forward. * The Canadiens were right to show Mikhail Grabovski some leniency after he abandoned the team last week when he was scratched for a game. Their mercy certainly was helped, however, by the fact that Tomas Plekanec is sick. * CTN is all kinds of fired up to see Jokerit take on the Penguins in an exhibition next September. CTN has always had a soft spot for the Finnish club, which is annually among the upper echelon of Finnish teams.